Cotman Vistas opened in May, 2013, thanks to the support of our generous donors and funders. The Cotman Vistas (formerly New Circle Vistas) project is an opportunity for Maximum Accessible Housing of Ohio to take advantage of a rare set of circumstances. It provides the best accessible and affordable housing for people with physical mobility disabilities. It is a model of accessibility with an accessible housing training suite. Cotman Vistas was designed to replace our oldest building, Circle Vistas. When we renovated an old furniture warehouse into Circle Vistas in 1984, it was the first apartment community in Northeast Ohio specifically designed to allow people with mobility disabilities to live independently. Over 25 years later, the building and the accessibility features became obsolete. 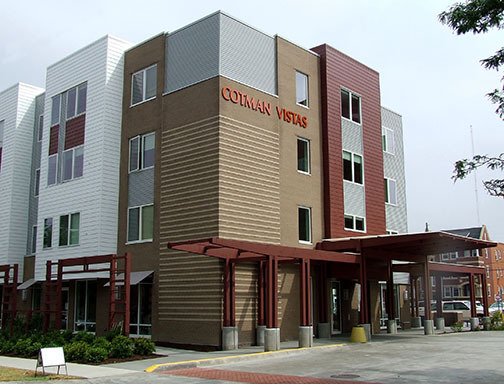 We are committed to making Cotman Vistas a model of accessible housing. From the beginning, the tenants of Circle Vistas were excited about and supportive of Cotman Vistas, embracing the opportunity to live in a new, modern, sustainable, green building with outstanding accessibility. Now that they have moved in, the Cotman Vistas tenants are enjoying all their new homes have to offer. Not only do our tenants need accessibility features, they also need affordability: their average income is less than $1,000 a month. We received permission from the US Department of Housing and Urban Development (HUD) to transfer the Section 8 contract from Circle Vistas to Cotman Vistas. This enables our tenants to continue to pay only 30% of their income toward rent. Interested in applying for a Cotman Vistas apartment? Click here to learn more. Cotman Vistas construction made possible by these funders: Case Western Reserve University, City of Cleveland, Enterprise Community Partners, Forest City Capital Corporation, Ohio Capital Finance Corporation, Ohio Housing Finance Agency, and the U.S. Department of Housing and Urban Development. Our $500,000 Capital Campaign provided additional accessibility and green building upgrades; many of these features are described here. We are grateful for the generous support of the donors, foundations, and corporations who contributed to the Capital Campaign. Thank you to all our Capital Campaign donors! Click on the links below to see how this state-of-the-art building progressed through construction. Building progress picture gallery: See how the building evolved throughout construction. Construction work picture gallery: See close-ups of the building and the work done.